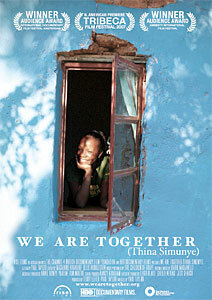 We Are Together (Thina Simunye) (Director: Paul Taylor, UK, 2006): It would be pretty hard to make a bad film from such promising material, and I’m glad to say that director Paul Taylor has not made a bad film, though he takes us through some pretty grim territory. 12-year-old Slindile Moya lives with several of her siblings at the Agape orphanage in South Africa. Both of her parents have died from AIDS, and her older siblings can’t afford to care for the younger ones at home anymore. What holds this incredibly close-knit family together is music. The younger ones sing in a choir at the orphanage, and when the whole family is together, they are always singing. When a chance comes for the choir to record a CD and go on a fund-raising tour for the orphanage, the children are incredibly excited, but when the trip falls through and Slindile’s older brother succumbs to AIDS, our hearts break with her. But as usual, the music pulls everyone through, and they finish the CD anyway, hoping for other opportunities. There are a few more twists and turns in the story that I won’t share, but through it all, Slindile keeps singing and smiling. It might appear that it was easy to make this film. These are incredibly beautiful children making astonishing music, and if you just left a camera rolling, you’d get a good film. But director Taylor takes us into some incredibly intimate places and lingers there, letting the full emotional impact of these children’s lives take hold of the audience. As with Born Into Brothels, the film has led the filmmakers to become involved in a charitable project, and I recommend that you buy a CD of the gorgeous music of the Children of Agape, which will go to support the children’s education costs. Unfortunately for us, the film premiered last night at the Tribeca Film Festival in New York, and so the director was there with 14 of the children. Here in Toronto, we had one of the producers, Pauline Von Moltke, who was gracious enough to conduct a Q&A. Unfortunately, my recording wasn’t very good, so I’m not going to post it. This entry was posted in Documentaries, Film Festivals, Hot Docs and tagged #hotdocs07, children, HIV/AIDS, southafrica. Bookmark the permalink.